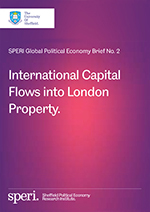 A new SPERI Global Political Economy Brief by Professor Rowland Atkinson, published today, assesses the growing international flows of capital into London’s property market. The new Brief presents research findings from a two-year research project, led by SPERI Associate Fellow Rowland Atkinson and involving academics from Goldsmiths and York universities, which involved interviews with the super-rich in London and Hong Kong. It looks at the drivers behind growing international investment, why London is the preferred city of choice for the global super-rich, and the social impact upon the city which is experiencing a domestic housing crisis. The Brief concludes by making a series of policy recommendations that could be implemented to address the city’s housing crisis. The researchers call for the creation of an Inclusive City Fund paid for by a new levy on sales of luxury London homes worth over £5 million. This ‘premium property’ levy could raise over £85m a year for new social and affordable housing in London. Download Global Political Economy Brief No. 2: ‘International Capital Flows into London Property’. The new Brief is the second in SPERI’s new series of Global Political Economy Briefs. The first Brief ‘Ethical Audits and the Supply Chains of Global Corporations’, by Genevieve LeBaron and Jane Lister, was published in January 2016.